Carpet care tips from Active Chem-Dry. Look for information on stain removal, carpet care and routine cleaning from our official blog. For direct questions call us at (949) 612-7464. Limit the exposure to dirt, particles and outdoor contaminants whenever possible. Doormats are not expensive and are easy to use and to clean. We recommend a doormat for every exit and entryway of your home. Doormats are excellent for preventing dirt from entering your home or reaching your carpet. CleanLink.com reports that doormats can prevent up to 98% of the dirt and contaminants from the outdoors from entering your home. So much dirt is tracked into a home or onto carpet from the bottom of shoes. Using a doormat means that you can limit the amount of dirt that people will bring in with their shoes. Doormats are one of the easier forms of carpet care. We know shoes bring in a lot of dirt. You should remove your shoes before stepping onto carpet. You should also request that guests remove their shoes too. If you leave your shoes on tile flooring or on a rug or doormat in a mudroom you ensure that none of the dirt on the bottom of them reaches your carpet. Be sure to have your children remove their shoes too. Kids shoes can bring in a lot of contaminants from playgrounds, schools and the outdoors. Shoes are the main source of lead contaminated soils that enter a home. If you remove your shoes you will reduce lead dust levels nearly 60% and reduce exposure to carpet allergens, including dust mites and pesticides. Shoes bring in manmade carcinogens from parking lots and tar too. If you remove your shoes you will protect both your carpet and the health of your home. Politely ask guests to remove their shoes. Even let them know it is a rule in your home ahead of time if they want to bring slippers. Once your carpet is no longer subjected to shoes you will start to see great results. You might have noticed there is very little cleaning in our carpet care tips so far. Sometimes keeping carpet clean is more about what you should stop doing than what you have to start doing. We have explained the importance of doormats and removing your shoes before going inside. What should you wear on your feet when you are inside your home? We recommend slippers, socks or slide-ons indoors. Be sure that whatever you wear on your feet indoors you don’t also wear outside. Check that the bottom of the socks or slippers are clean before walking on carpet. It is important not to have bare feet on carpet. Bare feet are often oily. The oil from the feet will permeate into the carpet. That will cause unwanted soiling to occur. Some carpet cleaning tips are common sense. If you want to keep your carpet clean don’t eat food on it. Do you or your family eat snacks like popcorn or chips in rooms with carpeting? Or do you drink soda, coffee or juice in those rooms? We recommend you stop if possible. Encourage everyone in your family to eat their meals and snacks in the kitchen or over hardwood or tile surfaces. Food and liquids contain oils, dyes, acidic components and other ingredients that can stain your carpet and even cause permanent damage if not treated. The dirtiest carpet in a home is the carpet that is exposed to the most traffic. You can prevent carpet from too much exposure if you rearrange the furniture in your rooms on a regular basis. If you move the furniture around you will create new traffic patterns. You will also prevent indentations from heavier furniture sitting on a portion of your carpet for too long. Another one of our carpet care tips that will protect your carpet and prevent dirt is to place carpet runners throughout your home. Carpet runners should be placed in heavy traffic areas, including hallways, stairways and entryways. Carpet runners are easier to clean than wall-to-wall carpet. Some carpet runners are made from plastic materials that are very easy to maintain. If you choose a plastic carpet runner be sure it doesn’t have adhesive on the back. Adhesives could attach to the carpet and are hard to remove after too long. Area rugs are another way to prevent carpet from too much traffic. Our carpet care tips will help prevent larger amounts of dirt from reaching carpet. Some can even protect the health of your home too. But carpets will still become dirty over time and require professional attention. 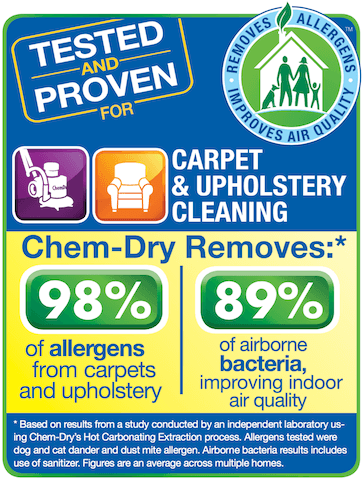 Active Chem-Dry carpet cleaning delivers healthier services with cleaner results. Carpet dries in 1-2 hours and we don’t use harsh or harmful chemicals. Learn more about our cleaning services or call (949) 612-7464 for more information.